EXT2, NTFS, and HFS+ OH MY! If these acronyms don’t mean anything to you, you’re not alone. This article will walk you through what they mean, and why it matters when delivering your DCP to festivals or theaters. Before getting into it, be warned that this may get a little technical. Why Won’t This Work On My Mac? There are many filesystems in use across the world of computers. The above lists the most popular in the world of filmmaking and digital cinema. There’s a ton of history with regard to filesystems and operating systems. This Howtogeek article covers the most popular filesystems in much more detail. By default, the latest version of OS X (dubbed El Capitan), can create, read, and write to three filesystem types: OS X Extended, MS-DOS (FAT), and ExFAT. Caption: This list in the Mac OS disk utility gives us a clue as to which filesystems are supported by the Mac. Drives formatted for delivery to digital cinema servers are usually formatted EXT2 or EXT3 for Linux. 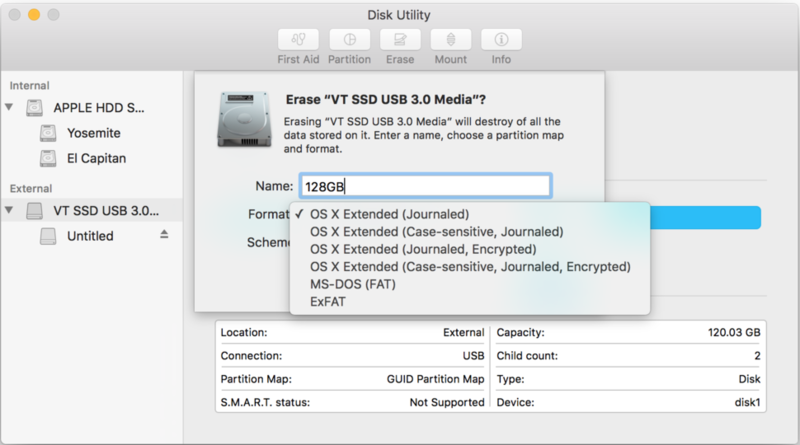 Without third party software, your Mac won’t be able to recognize the filesystem of the Linux formatted drive. Sort of feels a bit like a time-warp back to 1993 right? This basic incompatibility is also the reason that you cannot simply copy your DCP to a thumb drive using your Mac and expect it to work in a digital cinema server. Digital Cinema Initiatives, LLC (known as DCI) the company that created the DCP specification worked really hard to make sure that the standard was built on open technologies. This was meant to ensure that no one technology company could obtain undue influence in the market. Hollywood has seen many film-tech companies rise to a dominant position (Technicolor, Dolby, etc) and didn’t want computer or software companies to be in a similar position when projection switched to digital. 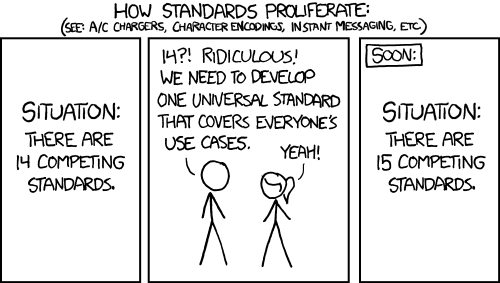 This commitment to open standards meant that the industry adopted a Linux-centric position. All DCI compliant playback servers run a variant of Linux. Because the computer that will play your DCP is running Linux, in order to ingest (copy) your film to it’s internal hard drives, the drive you plug into the server needs to be recognized by the Linux operating system. While it is true that your drive might be able to connect to the server, it is the drive’s formatting that determines if it is recognized or not. There are a ton of different variants of the Linux operating system. Some have software that supports the hard drive formats created by Macs and Windows machines, and some don’t. That means that the drive containing your DCP needs to be formatted specifically for Linux using the Extended File System which goes by EXT for short. There are a few different versions of the EXT format and luckily, they are just numbered: EXT2, EXT3 (which is basically ext2 with journaling), and EXT4. Because of the amount of variance between different flavors of Linux, in order to have the best chance that the drive will be recognized, EXT2 should be used as it was the standard for the longest period of time, and has the widest support in various versions of Linux. Some will argue for EXT3 as it is a more modern implementation of EXT2, but Cinematiq has seen some library management systems (LMS) at some cineplexes that don’t support EXT3 formatting. Complete compatibility also hinges on a couple of other key pieces like partition tables and inode size that we won’t go into here. In short, as a filmmaker authoring a DCP, you won’t necessarily know what theaters your DCP drive may end up at. The best way to ensure that you’re compatible, is by following the standards that Hollywood created by using the industry standard CRU drive formatted EXT2 for Linux. Ensuring compatibility can be done by, using a computer running Linux to create the drive, copy the DCP, and run the final verification (hash-checks). Once the drive is made, connect it to a Linux machine or D-Cinema server and make sure that the DCP shows up and is able to be copied. Filmmakers or festivals without a comfort with Linux may find that this aspect of dealing with DCP to be rather frustrating, and will find DCP drive preparation is better left to a digital lab service or an IT systems administrator. Search our site for what you're looking for.